Jim grew up in Hanover County, VA and was introduced to aviation at the age of 12 by his flying farmer neighbor and mentor, Mr. C. Irving Smith. While in junior high he began taking flying lessons. 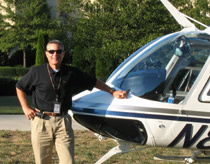 He became a Commercial Pilot with Instrument and Multi-engine ratings, while attending college. After flying several thousand hours in “fixed wing” aircraft including jets, and only a single co-pilot mission in a helicopter, he decided that “vertical flight” was the career direction that he wanted to move towards. He then proceeded to earn all his helicopter add-on ratings, including his Rotorcraft Instructor license. Jim still resides in Hanover County and serves on both the Hanover County Airport Commission and the Hanover County Law Enforcement Advisory Board.